Platinum group metals are some of the rarest minerals on earth. When most people think of platinum group metals, they only focus on platinum and palladium. 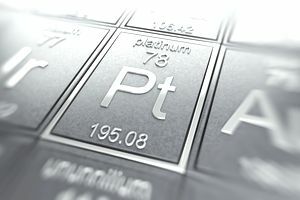 With a high resistance to heat and properties of incredible strength platinum and palladium are vital components of catalytic converters that clear poison emissions before they pollute the environment. However, platinum and palladium are only two of the six metals that make up this vital group of elements. Rhodium, osmium, iridium, and ruthenium are the other four metals classified as PGMs or platinum group metals. There are two groups of PGMs. The palladium group includes platinum, palladium, and rhodium. The iridium group includes iridium, osmium, and ruthenium. In this piece, we will examine these other four, minor metals in terms of their history, characteristics, and uses. William Hyde Wollaston discovered rhodium in 1803, soon after he discovered palladium in 1802. Rhodium has a silver color; it is durable and has a high reflectance. Rhodium occurs in raw platinum ore -- a rare element, it comprises an estimated 0.0002 parts per million of the earth's crust. Annual production is around 30 tons per year. Most acids do not attack rhodium; it has a higher melting point than platinum as well as a lower density. The primary use of rhodium is in automobile catalytic converters, just like platinum and palladium. Since rhodium does not tarnish, it has applications in the manufacturing of jewelry. It gives a reflective white surface to white gold via electroplating. It also prevents sterling silver from tarnishing. Wollaston and Smithson Tennant discovered osmium in 1803. Osmium is a product of platinum, nickel and copper ores. Osmium is even rarer than rhodium -- in fact, it is the least abundant stable element in the earth's crust with an average occurrence of 50 parts per trillion. Total osmium production is less than one ton per year. In its pure state osmium is highly toxic, therefore, commercial applications require alloying it with other metals. Osmium alloys are very hard. Fountain pen tips, instrument pivots, and electrical contacts often require osmium. Due to the highly reflective nature of osmium, space missions have had ships fashioned with mirrors coated with osmium. Smithson Tennant discovered iridium in 1803. Iridium is also a rare metal occurring at a rate of 0.001 parts per million in the earth's crust. Iridium occurs with the highest concentrations in three types of geologic structures -- igneous deposits, impact craters, and deposits reworked from one of the former structures. The world's largest deposits are in South Africa, however, large copper and nickel deposits contain iridium. Annual iridium production is around 3 tons. Iridium is required for many electronics-related products. Its applications also include the production of crucibles necessary for growing large, high-quality crystals. Spark plugs also contain iridium as do electrodes and chemical catalysts. An isotope of iridium is also a source of gamma radiation for cancer treatments. Karl Ernst Klaus discovered ruthenium in 1844. Ruthenium is the 74th most abundant metal in the Earth's crust. The ore generally occurs in ores with other platinum group metals in the Ural Mountains and in North and South America. Annual production totals around 12 tons of ruthenium each year and world reserves total around 5,000 tons. Ruthenium hardens platinum and palladium, therefore; it has applications in the production of wear-resistant electrical contacts. Ruthenium also has other applications in medicine, solar energy conversion and data storage. Ruthenium is a versatile catalyst and has impressive properties in quantum critical point behavior, exotic superconductivity, and high-temperature ferromagnetism. Rhodium, iridium, osmium, and ruthenium only trade in the physical market -- there are not futures contracts on these metals. PGMs are scarce metals. As technology advances so does the applications for these amazing hard, durable metals with many unique properties, so demand increases. As an example, the annual consumption of iridium alone grew from 2.5 tons in 2001 to 10.4 tons in 2010. The rarity of all of these metals truly classifies them as precious metals.